In honour of International Women's Day 2013, I have decided to write about my most intriguing female ancestor, my great great grandmother, Emma Frances Ray. Emma Frances was born on 21st July 1808 and baptised at St James Piccadilly, on 18 Sep 1808, the daughter of bookbinder Stuart Ray and his wife Elizabeth. She was the second of 11 children of Stuart and Elizabeth, all of whom were baptised at St James' Piccadilly. 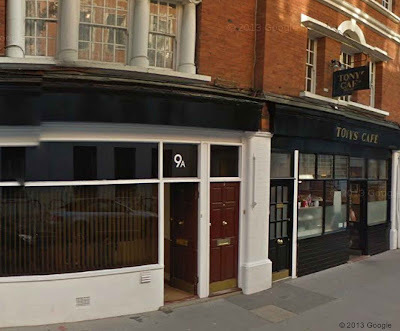 The Ray family lived for a while in Norris Street, Westminster (just off Haymarket), before settling in the mid 1820's into 43 Duke Street, St James', just off Piccadilly, where they lived for many years, and where Stuart Ray carried out his bookbinding business until he died in 1855. 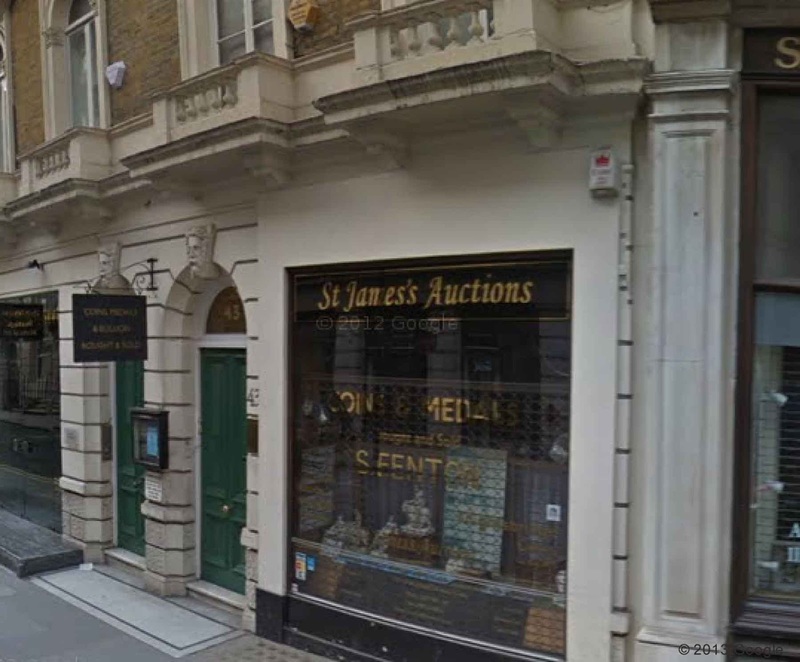 Today, number 43 is occupied by St James's Auctions, specialising in coins, metals and bullion (see current photo thanks to Google Maps). 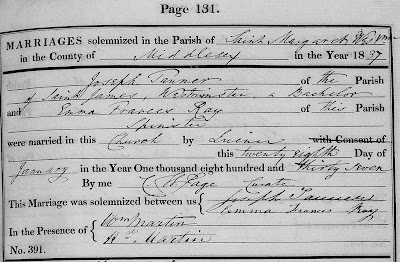 On 27 January 1837, Emma Frances Ray married Joseph Tanner, at St Margaret's, Westminster, by licence (see parish record right). However, at the time of this marriage, Emma Frances Tanner already had a daughter, Emma Lizzy, who was born on 18th July 1835. She then went on to have a son, Joseph Henry Tanner, who was born on 17th April, 1837. Both these children were baptised on 4th February 1842, at Holy Trinity church, Brompton Road, Kensington (see parish record below). She named the children's father as Joseph Tanner, gentleman, but gave their address as 43 Duke Street, Westminster. This was her parents' family home, with whom she was living, with her two children, in the 1841 census, as "independent" but with no Joseph present. So already, I have a few questions: why didn't Emma Frances marry Joseph Tanner before their first child was born? Was Joseph Tanner already married? Why is he not present in the 1841 census? Was he already deceased? However, the plot thickens! I am still not sure what happened to Joseph Tanner (did he die, disappear or marry someone else? ), but in February 1842, when Emma Frances baptised these two children, she must have already been 7 months pregnant with twins by great great grandfather Edward Clifford, as they were born on 6th April 1842. In fact the choice of place for the baptism may have been influenced by him, as in the 1841 census, Edward Clifford was found living in Brompton Vale, Kensington, not far from Holy Trinity church. Edward Clifford and Emma Frances Tanner went on to have four boys, the two twins (Edward, my great grandfather, and Frank), followed by Stuart and Robert Henry. I have the birth certificates for the two twins; Emma Frances registered them on 10th May 1842, naming them as Edward Clifford and Frank Clifford, with their father's name blank, and her own name as Emma Frances Tanner. So they are listed in the index as Edward Clifford Tanner and Frank Clifford Tanner. The birth registration of their third son, Stuart Clifford, has not been found, but by the time their fourth son was born, on 5th October 1846, his mother's name is shown as Emma Frances Clifford, formerly Ray (no mention of Tanner), and the father as Edward Clifford, clerk in Her Majesties customs. As far as I know, however, Edward Clifford never actually married Emma Frances and no baptism records have been found for any of the four boys, who all went on to use the Clifford name later in life. By the time of Robert Henry's birth, Edward and Emma Frances were living together at 9 Chapter Street, in the parish of St John the Evangelist, Westminster. This was also the address given for Edward on the inquest into his untimely death in 1848, which is described here. It is an area of Westminster which has recently been undergoing considerable "gentrification" (see current photo courtesy of Google maps). I imagine that Emma Frances would have been distraught at Edward's death, with 6 children, aged between 2 and 13, to look after when he died. 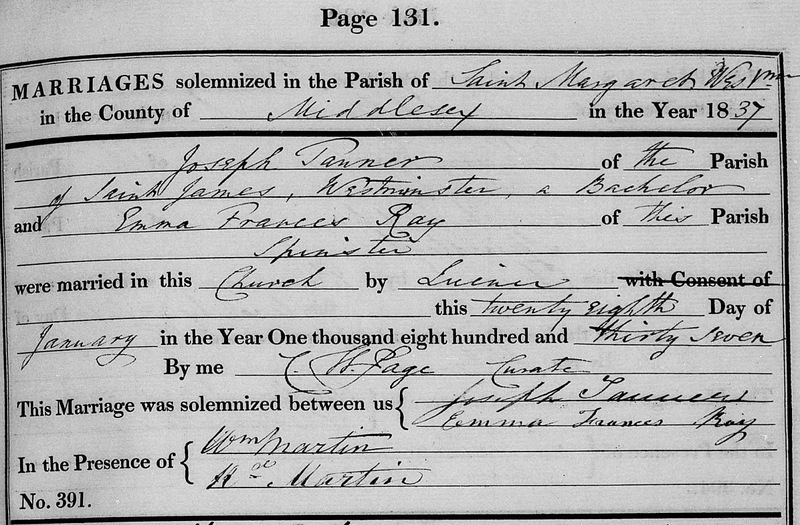 By the time of the 1851 census, Emma Frances had married again, so presumably Joseph Tanner was deceased by then. She married Thomas Newland, a tailor and widower, in the parish of St Mary Lambeth. I am not sure why they crossed the river to marry, giving their address as 16 High Street, Lambeth, possibility for reasons of anonymity. In the 1851 census, we find them both living at 9 Chapter Street, Westminster, with two of his children, her four Clifford boys and 5 month old Frederick Thomas Newland. On the birth certificate of Frederick Thomas Newland, she gave her name as Emma Frances Newland, late Tanner, formerly Ray, which would suggest that she never did marry my great grandfather Edward Clifford. 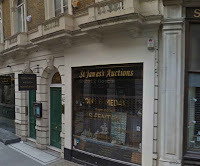 By 1861, the Newland family had moved to 50 Chapter Street, and in 1871 they had moved again, but not far away, in Upper Garden Street, adjacent to the church of St James the Less, Westminster. By the time of the 1881 census, Emma Frances Newland had again been widowed and was living with her son, Robert Clifford, a drover, his wife and their three children in Romney Street, Westminster, close to Lambeth Bridge. Family stories suggest that Emma Frances Newland died in St George's workhouse and I found a probable death of "Fanny" Newland, age 79, "unknown of Lambeth" in the St George's workhouse. I can't help feeling that Emma Frances had a difficult life, and ended it with no family to take care of her. She is definitely my most intriguing female ancestor! Great article Rosemary, sounds like quite a puzzle though. I wonder what her reasons were to seemingly leaving such an intermittent trail of clues behind? I know 'gentleman' is a bit of a weakly defined title, but it makes me wonder whether Mr Tanner was already married and/or in some kind of highly respected position where he might want (or be able to) contest the parentage of her first child. Obviously he didn't get away with that as he seems to have eventually embraced his fatherhood when she became pregnant for the second time - marrying her just prior to the second birth. Maybe newspaper articles would cover this kind of 'scandal' (more so if he was already married or of some 'high standing'), or maybe there will be documents where Emma has had to go through the humiliating ordeal of dragging her case through a court in order to prove parentage (i think this angle was covered in the Alex Kingston episode of WDYTYA). 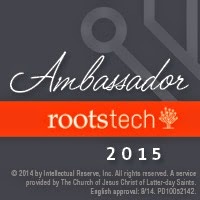 Worth a look if you haven't already. Many thanks for your helpful comments. I, too, wondered if he was maybe "older" as one of the possible death certificates is a 78 year old "gentleman" who died in Somers Town in November 1842. The Court records are a good idea, as are the newspaper records, I will take another look. I've tended to leave him to one side as he is not a direct line, but I remain intrigued, and it is a permanent niggle as to why Emma never married my gg grandfather Edward Clifford.